The first Facebook Farewell Party took place on June 23, 2015 in the Stadsschouwburg Amsterdam. It was an initiative of Waag Society, Amsterdam Municipal Theatre, and HVA - Institute of Network Cultures. Partners included Hackers & Designers, Greenhost, WORM, Het Nationaal Toneel, Dawn, Democratie & Media, Hogeschool van Amsterdam, Kenniscentrum CREATE-IT, Emily Hannah West and Stefan Schafer, Hans Schnitzler, Aral Balkan, Sanne Wallis de Vries, and Submarine. The programme included talks from prominent social media activists, philosophers, and digital community leaders. After the programme, the audience participated in DIY, hands-on activities about protecting online privacy, and enjoyed themselves with a big party in the bar area. Want to organise a Facebook Farewell Party in your area? Find interested (and interesting!) partners to speak, perform, or hold workshops that are based around the problems with modern social media models (like privacy, the selling of personal data, or promoting addictive behavior). You can (and should) have fun with this! It's a serious topic, but the tone can be slightly "cheeky." It is a party, after all. Find a nice, large venue that can help you with organizing the event and spreading the word (like the Stadsschouwburg Amsterdam, for example), and plan a date for the event. If you're inexperienced with hosting large events, you might want to ask the venue for advice (like how to hire DJs or bar staff for the party, for instance). Create a Facebook Liberation Army group on Facebook to help spread the word in the Facebook community and generate interest in your event. Spread the word on other social media venues using hashtags like #FacebookFarewell, #FacebookLiberationArmy, or #FacebookFarewellParty. It can also be nice to find current news items that highlight some of the problems with modern social media models and share them with friends. Let local media outlets know about your event with press releases, and ask them to attend. Print posters, flyers, and pamphlets about the event and spread them around your city (you're welcome to print our Directives and Instructions for this purpose). Try to generate attention to boost attendance before the event. Enjoy the fruits of your labor and have fun, but also think about documenting the event. Maybe hire a professional photographer to snap photos, or record the event and place the video online. You might also want to make infographics, hand-outs, or other print material for the event that can be published online afterwards. Check out these resources to learn more about the Facebook Liberation Army's activities and empower yourself. 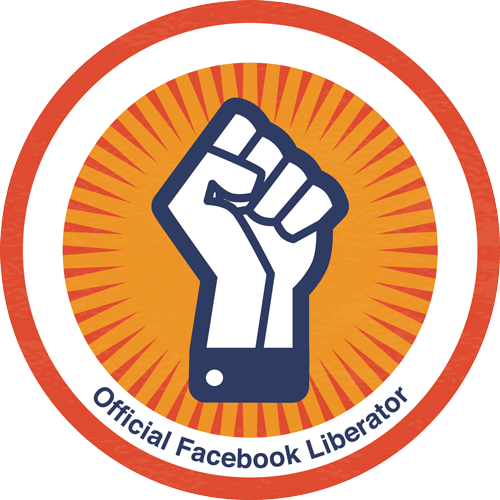 Download your own "Facebook Liberator Badge"